In addition to these fine galleries where you can see my work in person and interact with their engaging staffs, you may view and purchase paintings from the comfort of your chaise lounge via the Artful Home catalog. Just announced, my paintings are featured in the Artful Home Fall Collection, in both the print catalog and online. I'm told work tends to move quickly from inventory, once the catalog circulates to over 700,000 homes, so don't hesitate if you see something you like. It's back in the studio for me! Plaza Art Fair is in four short weeks and I've got ambitions to debut two new large paintings at the show Hope to see you in Kansas City, September 22 - 24. I don’t remember where I read or heard that quote but it struck me as significant enough at the time that I both wrote it down and committed it to memory. I believe it was spoken by someone in the context of being an artist and the difficulty of staying on a directed path when there is much distraction and many influences ready to de-rail one’s progress. It is an important idea to keep close when plotting one’s course as an artist. Setting goals and aligning oneself with them, means having a guide for when to say yes to an opportunity and, very importantly, when to say “thank you, but no.” Likewise, being too heavily weighted by or dependent on one way to show and sell ones work becomes a problem when the one way is no longer working. The literal “road” for me was a career dominated by traveling around the country to juried art fairs. While this particular track included some stellar adventures and countless sold paintings, it also meant many weeks and weekends away from home and the studio. For a growing chunk of each year, I was going to a show, at a show or headed home from one, primarily to wash clothes and re-pack my vehicle for the next trip. This lacked balance. Well, let’s say, I lost my balance. With unequal parts design, circumstance and necessity, I am currently testing out the idea that I am “retired” from art fairs. At the very least, I am on an extended hiatus. This does not mean that I have pivoted to spending long, languid days in the studio. Coming off the road is a challenging transition involving partnerships with galleries, the pursuit of commission projects, scheduling exhibitions for 2018 and being open to the novelty of extra work that pays up front, or at least by the end of the week. An unforeseen bonus of staying where I live means being present in my arts community of which I am a proud member and advocate. I no longer have to send my regrets for weekend events. I can reciprocate the support I’ve received by attending the openings, talks and studios of peers here in Kansas City. This summer, as I begin my term as Board President of the Kansas City Artists Coalition, I can better imagine my role in encouraging others to participate in an organization that has benefitted so many artists, including me. Being here as opposed to everywhere else has a meaningful momentum of its own. Have I missed being on the road this year? Not really. Do I miss my friends? YES! The one outdoor show I have scheduled in 2017 is the prized Plaza Art Fair. It is conveniently located just a few miles down the road from where I live and features many of my favorite artists and friends from the past decade. Seeing them only in passing at such a big show will, I hope, open up the possibility of being more intentional with our visits in the future. Why wait for an art fair to bring us to the same town when we could plan a meeting or trip somewhere that would deepen our friendships and our work? In the meantime, I am headed to Nashville this week for a talk and opening at The Arts Company with artist Marilyn Artus. I am proud to be showing with Marilyn at this vibrant venue run by a passionate art crusader, Anne Brown. Anne’s staff produced a video of my recent visit to deliver work for the show as well as commissioned works for one of their largest clients. If I don’t see you in Nashville, I will look for you at the Plaza Art Fair and beyond. I am sticking to this long road, keeping it “between the ditches” as we show warriors would say, and endeavoring to stay in touch, always. We are feeling a big loss these days. After nearly sixteen and half years with us, our beloved Deacon died on the 24th of April. His last week was fairly quiet. He was slow to get around, but still eagerly got up with me at 5 o'clock each morning, taking his medicine and a going out for a brief walk in the dark. He ate only what I cooked for him: bacon, eggs, cheeseburgers, sweet potatoes. Donald gently brought up what we might have to do for him, but said he would wait for me to come to terms with it. Deacon had a knack for perking up after a long day of sleep and each evening, I could easily justify more time with him. After all, when I arrived home, or just walked in the room, he welcomed me as he always did - up on all fours, a wagging tail, audible, excited sounds at the front door. Donald would say "you should hear him when your car turns onto our block. He knows you are almost home." At some point, in his very old age, I started calling him "Little Buddy." It was my softhearted reaction to the physical changes I saw in him. His diminished hearing seemed to make him cling to me even more. He'd stay close to me in the house, so as to not lose track of me. He would not wander too far in the yard, looking back to make sure I was right behind him. It all reminded me of his first few weeks as our puppy. In January of 2001, we spent nearly every moment together as I attempted to house train him from a third floor walk up in Chicago. I balanced him on my lap as I painted, to discourage "accidents." We would run up and down the stairs, every hour at first, and walk along the frozen tundra of Lake Michigan. He'd cry after enough time on the ground and I'd gather him up into my parka, carrying him the rest of the way home. He was the "new kid" on the block. attracting the attention of fellow dog owners who met at sunrise and sunset on Jarvis Beach. 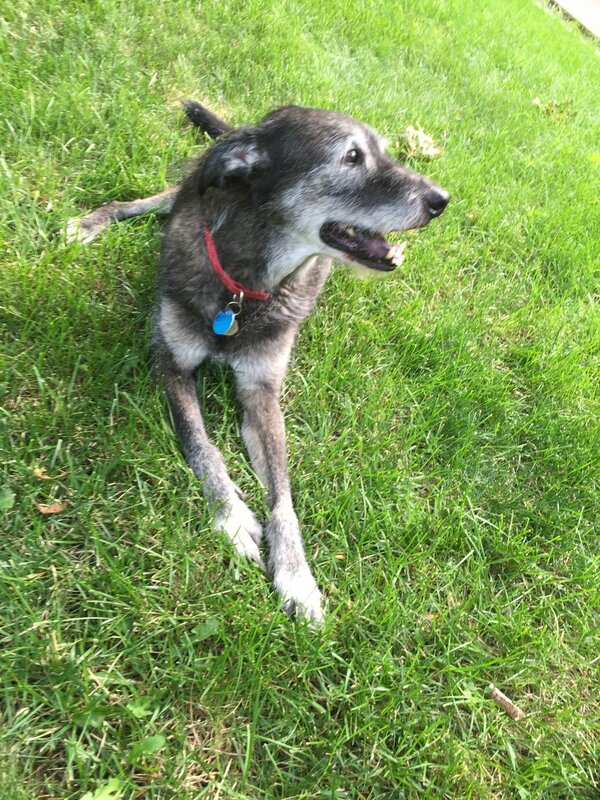 Similarly, as a very senior dog, people stopped more frequently to greet him and ask, "how old is Deacon now, anyway." "Sixteen!" I would reply with gusto. I was proud that we'd made it, this great distance, together: Cross country car trips, endless hours in the studio, 10,000 miles of walking, never sleeping too far from one another when we were under the same roof. In my years of traveling to and from art fairs, his keeping company with Donald at home made me less anxious about being away. In what we didn't know were his last couple of hours, Deacon attempted one final to retreat to his bed. Donald was there and helped him to lay on his side. I was urged to come home quickly so that we could take him to the vet one last time. When I arrived, his head turned toward me in response. I stroked his face and body and placed my hands on his chest to feel his slowing heartbeat. "He's still here," I said to Donald. I moved my hands away so that Donald could do the same. "I don't feel anything," he said. I looked into Deacon's eyes, and could see that he was gone. In the days after, we tried to be consoled by the way that he left, at home with just us there. We welcomed the chance to take a quick trip to deliver artwork to Nashville. The brief change of scenery was only that, though. Coming home to a house without Deacon, an empty doorway, a vacant bed, meant we could not avoid the sad reality of his being away from us. It is an exceptional adjustment that will take the forgiving passage of time to grow into. The joy of sharing life with Deacon, my Little Buddy, can't be diminished by his absence. 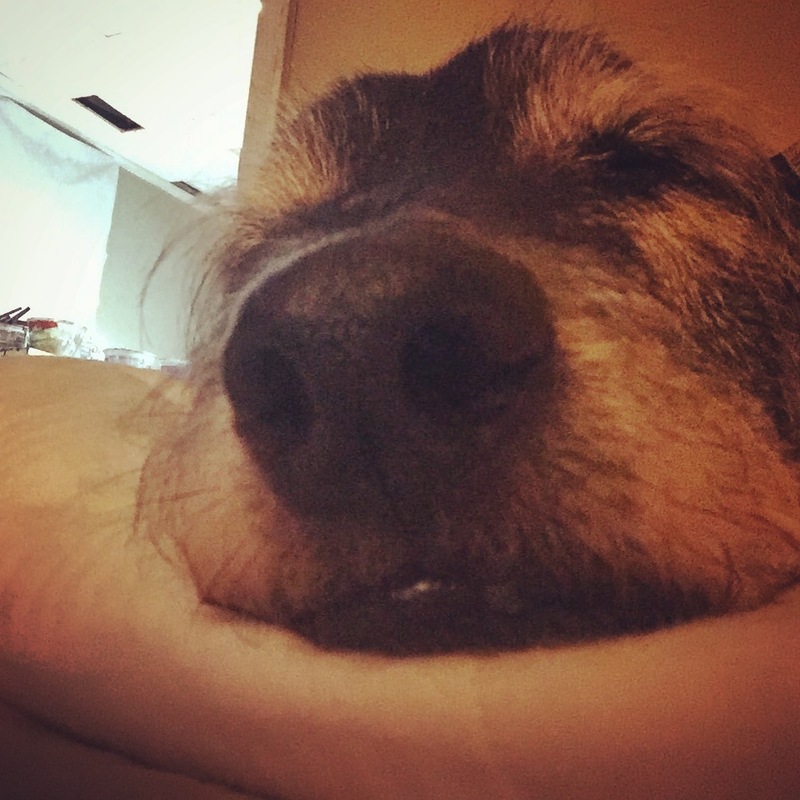 His soft, comforting fur that I so often laid my head on at night, his enthusiastic companionship and pure longevity deserve to be remembered in the full light of love. February took my breath away and the month isn't over yet. Michael Smith Restaurant hosted a reception for me and my work which was celebrated with friends, artists and collectors. If you missed Nancy Smith's red carpet roll out (Prosecco and eight hour pork roast!) on February 7th, you can drop in anytime before March 31st to see my paintings and enjoy a James Beard Award-winning meal of your own. After a month of filming by producer Julie Denesha, the Arts Upload segment featuring me working in my studio aired February 16th on KCPT. Julie's presence was a great motivation to me and I was able to complete two large paintings as she recorded their progression. My friend Garry Noland (who I secretly call my Artist-Hero - don't tell him) drops by the studio and gracefully offers his perspective on what many of us are seeking to accomplish in the realm of abstract-minimalism. Deacon does not make an appearance in the segment, though he was always at the top of the spiral staircase keeping track of the goings-on. The bottoms of my well worn, paint encrusted slippers show up and I manage two sports analogies in relating my painting process. All in all, I'd call it a home run! And finally, after months of work by many folks, I served as 2017 Auction Chair at the Kansas City Artists Coalition annual fundraiser on Saturday, February 18th. An organization that is near to my heart, I have been donating my paintings and time there since moving to Kansas City in 2004. Please take a moment to read my program essay and maybe it will convince you to get involved. Now let's see what March blows in. Wake up. Walk Dog. Paint. 2017 is already loaded with activity down here at Laura Nugent Studio. I say "down here" as I happily celebrate 13 years working out of my lower level, home studio in Merriam, Kansas. While it is a little crowded wth new works in progress, I do still enjoy the ability to roll out of slumber, wander outside with dear Deacon and then get right to work. Currently, I am making work for my upcoming solo exhibition at Lowe Mill Arts Center in Huntsville, AL. The ongoing, small works series "Undiscovered Countries" is also in progress and evolving. You will soon find them available online at Artful Home. If you prefer in-person shopping in the US, don't forget Roan and Black Contemporary and The Arts Company, both lovely galleries handling my original work. 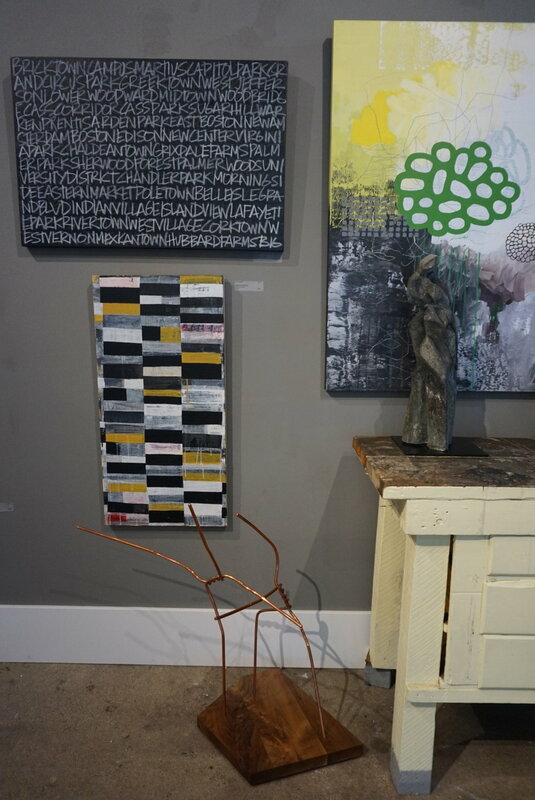 The tough-as-nails Late Show Gallery in Kansas City periodically stocks my work, both new and vintage. As I've been working this month, a crew from KCPT Arts Upload has been documenting my work process. It has been a fascinating experience so far. 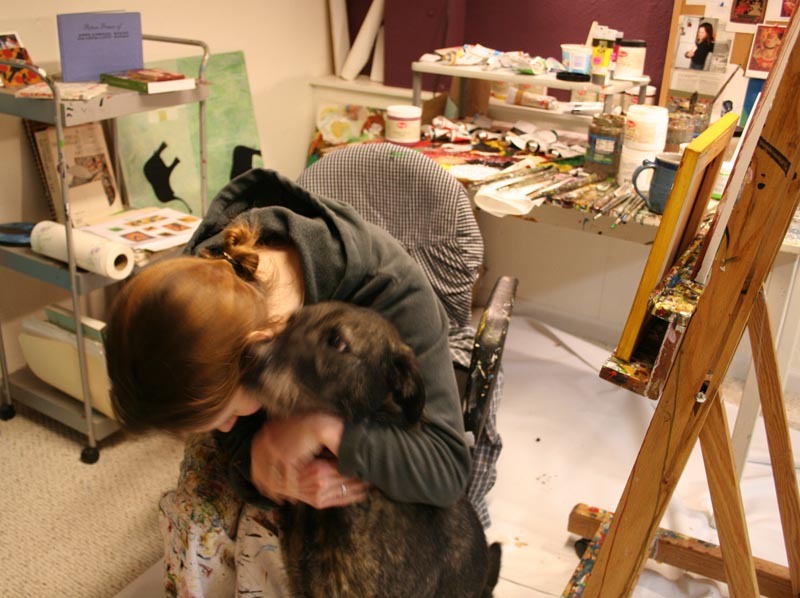 I have been surprised at how quickly I forget that I am not alone in my studio. Fortunately, painting still draws me in and holds my attention like nothing else and there have been moments when I have broken concentration and been surprised to see the television lights and camera lens nearby. Look for the finished segment in February - you know I will be posting a link here! And while you are visiting today, please check out the new Events tab featuring where and when you'll find my work in the days ahead. I hope to see you.